Heartsease is a reasonably pleasant post-war housing estate. Norwich did not need to expand as much as many cities of a similar size at the time, but there was a pressing need to rehouse the people displaced by the combined forces of the Nazi Luftwaffe and the City Council Planning Department, particularly of terraced housing in the path of the new inner ring road; although, of course, that was probably not the Germans' main motivation for bombing the city. Perhaps the main disadvantage from which the inhabitants suffer today is the distance of Heartsease from the centre of Norwich. It reminds me very much of the area of north-east Cambridge in which I grew up. 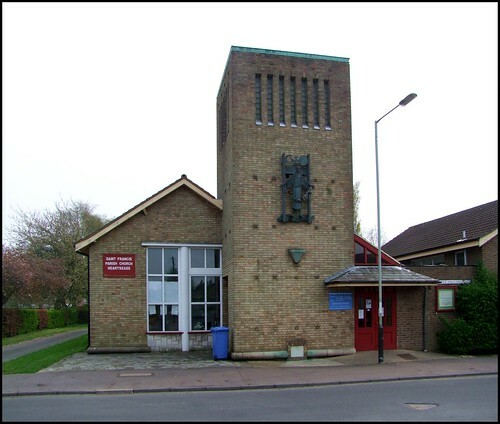 Like so many of these estates, the central focus of Heartsease is its Anglican parish church. It doesn't happen today, but when these post-war schemes were planned the developers catered for what were then seen as essentials: the schools, the shops and the churches. Nowadays, I suppose, we still think that schools are important; but apparently it is no longer thought necessary to provide for the spiritual needs of the community. And as for local shops, who needs them when we have a free bus to the out-of-town Tesco? Thus, we are steadily impoverished by our own increasing cleverness. St Francis sits at the junction of two roads in the residential heart of the estate, and it is imposing rather than large. Its tower is typical of the shopping centres and department stores of the late 1950s. St Francis, along with St Benedict, was one of the most popular non-Biblical dedications for churches at this time, perhaps reflecting a new and more contemplative theology. The equivalent church on Ipswich's similar Chantry Estate is also dedicated to St Francis. The architect here was JP Chaplin, familiar from work elsewhere in the city, and the money came partly from War Reparations grants for the six medieval city churches destroyed by German bombing. The foundation stone was laid on St Francis's Day, the 4th October 1956. Thank goodness for St Francis, not only for its existence, but for the excellent and little-known sculpture which adorns its frontage, and which would not be out of place in a much more metropolitan setting. It depicts the church's patron Saint in the context of the Canticle of the Sun. He is standing in the river, with Brother Sun and Sister Moon above him, and his birds flocking to greet him. Because Heartsease is distant from the city centre, and is in any case little visited, few people seem to have written about this statue, or even know of its existence. Bill Wilson, revising Pevsner's Buildings of England: Norfolk, does not mention the church at all, let alone the sculpture. I am grateful for the detective work of Leo Reynolds, who called on the Rector and was pleased to discover that the church retained newspaper cuttings about its origins. In fact, the sculpture dates fully twenty years after the building of the church, although it always seems to have been the intention that one would be provided. The artist was Mike Toll, at the time a teacher at the local Heartsease High School, and it was created with the help of the school's sixth form art students. It was paid for by the grandparents of a child born to a former curate of the church as a mark of remembrance. The sculpture is made of bronze, and coated in glass fibre and acrylic resin. The birds, however, are made of steel, and although coated in the same way they have corroded in the last thirty-odd years. It would be nice if they could be restored. The pedestal beneath the statue was provided in 1956, with the intention that a sculpture would some day be added. As it is, the sculpture of St Francis is rather more impressive than anything envisaged at the time, and easily the most interesting thing on the entire Heartsease estate.